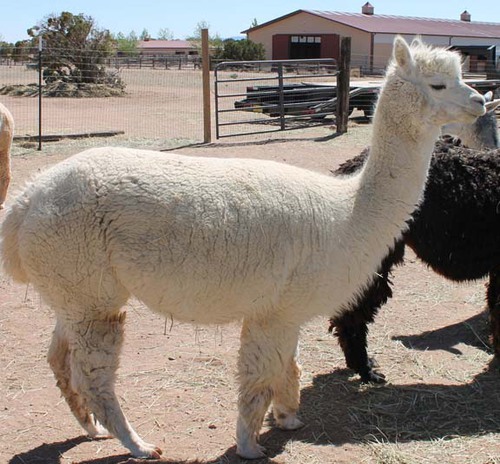 Full Peruvian, Amante de Peru can boast of the well-known Pperuvian Victor G4563 as his sire. Moreover, Amante has done well in consistently passing on the superior qualities associated with this elite foundation line to his offspring. Marina is a granddaughter of the famous Peruvian Bueno G173. Dark brown in color, Marina has the medium rose gray Columbia River's Astoria as her dam. Thus Marina contributes great color genetics to her offspring. 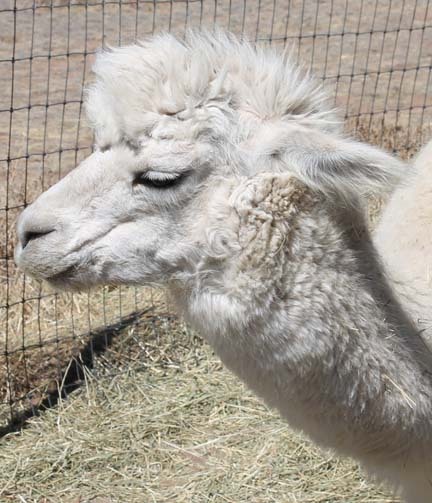 Victor Line Genetics - Three-quarters Peruvian and one-quarter Chilean, Puff is a classic white female, but with color genetics in her background from both her sire's and dam's sides. Her sire is the medium fawn full Peruvian CGA Amante de Peru, out of Pperuvian Victor G4563. Her dam, dark brown Columbia River's Marina, is a granddaughter of the famous Peruvian Bueno G173, and Marina has the medium rose grey Columbia River's Astoria as her dam. Puff reflects her quality lineage in her great conformation, classic head structure and perfect bite, along with a gorgeous top knot. Moreover, she has proven herself to be an excellent mother.